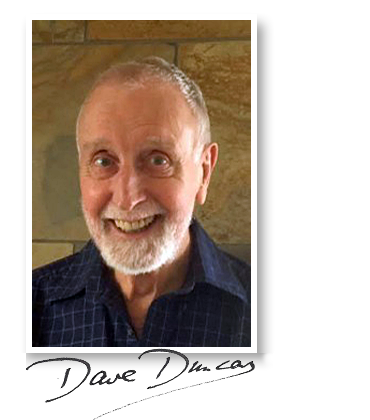 Canadian sff author Dave Duncan passed away October 29 after sustaining a brain hemorrhage in a fall. Originally from Scotland, Duncan lived all his adult life in Western Canada. He worked as a geological consultant until at age 53 he made the transition to full-time professional writer. He sold his sixtieth book this year – the science fiction novel Pillar of Darkness. He won two Aurora Awards, for his novels West of January (1990) and Children of Chaos (2007). He was an eight-time nominee for the Endeavour Award, given for a distinguished science fiction or fantasy book by a writer living in the Pacific Northwest. 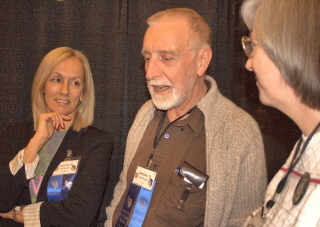 Duncan was both a founding and an honorary lifetime member of SF Canada, the country’s association for speculative fiction professionals. He was inducted into the Canadian Science Fiction and Fantasy Hall of Fame in 2015. 2009 Endeavour Award finalists Kay Kenyon and Dave Duncan with award committee member Page Fuller. This entry was posted in In Passing and tagged Aurora Awards, Canadian Science Fiction and Fantasy Hall of Fame, Dave Duncan, Endeavour Award, SF Canada by Mike Glyer. Bookmark the permalink. Dave Duncan was a warm and kind person who did several signings at the book store I worked at in the 1990s. Nothing but good things to say about him. I’ve read and enjoyed a good number of his novels. Never got to meet him, alas. RIP. I am a huge fan of the Seventh Sword and Man Of His Word series. Dammit. I also loved Man of His Word and The Seven Sword – his two most popular series. Condolences to the family and friends. This is very sad. RIP. I had no idea he so prolific, but I see that I have over half of his books as ebooks. I should elevate some in my virtual reread pile. I think I have read all his books. loved them all! He was a guest at Con*Cept in Montreal, a very nice person with a great sense of humour. I have read all of his books. Most of them many times; they are always the books I turn to when I need solace. I have thought for years how I would feel this day. The others get the glory and the fame, but you get the love of the people. And when at last you die, with your grandchildren’s children at your side and a multitude in vigil at the gates, then a world will weep. Thank you, Dave, for everything, every world, I will hold your little friends to my heart and teach my son to love them as much as I do. I just discovered him when Ironfoot came out – I’m so sorry for his family’s loss and I’m so grateful for what he’s left us. Thank you, Tricia. Dave’s own words are so fitting. He wrote as “Dave” because of the previous SF writer David Duncan, author of such works as Dark Dominion (Ballantine Books 1954). Oh, no! I’ve recently been on a Dave Duncan kick – recently read his “Irona 700” and his just published novel “Trial by Treason”. He was that rare author that didn’t seem to have been hit by the brain eater as he aged. His writing, to me, seemed the same as when I first read him so many years ago. I was looking forward to reading further books from him in the future. May he rest in peace. I will miss him as an author. His books were reliably enjoyable reads – I’ve got several on Mt. Tsundoku even now. He signed once at The Other Change of Hobbit, and I got to meet him then. How unexpected and sad. Dave Duncan’s works were a delightful find for me. The world is a little less bright without him.